The One Memory of Flora Banks by Emily Barr was ... a very different read. It was unexpected. And I definitely think that how different I thought this book would be is the reason that I was so attracted to reading it in the first place. And while I did like it, I wasn't entirely blown away by the story of by Flora Banks. But I wanted to be. 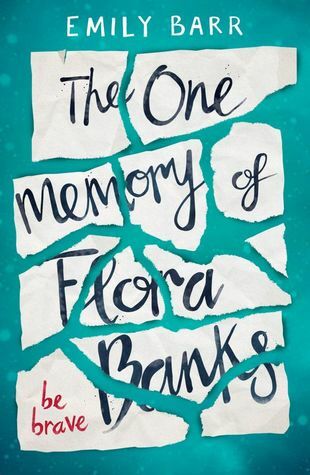 This is the story of Flora Banks, 17, and she is someone who has anterrograde amnesia, which means that she has no permanent memories before 7 years ago when she was in an accident. She can only hold new information in her head for a very short period of time, at the most several hours. So to get by, she writes notes on her arms and post-it notes, takes pictures on her phone, writes in a diary etc filling herself in on the events and important stuff between then and now. She's on medication, she's well looked after by her parents and her best friend. We meet Flora at a party, her hands say 'Be brave' and she goes onto leave the party and kisses a boy on a beach. Unfortunately it happens to be Flora's best friend's boyfriend who she kisses but the thing to be taken from that night is that Flora remembers the boy, she remembers the kiss, the beach, all the details of that interaction. The thing with her memory though means that as the narrator to this story, Flora loses a lot of information. Which she then relearns shortly after and that makes Flora's story really quite repetitive in parts which felt grating in the middle. I also found Flora's voice to be hard and factual which made it difficult for me to warm to her. I also wasn't thrilled with the idea of her chasing down a boy with her 'this boy will save me' thoughts but I felt like that was at least handled towards the end. The only relationship I wanted to explore more (as I didn't love Drake with the same fervour as Flora!) is the one with Jacob, her brother. This book needed more Jacob, in my opinion. I think the thing in particular that I loved the most about Flora is that she is courageous. She really takes that 'Be Brave' on her hand to heart and instead of cowering indoors where she knows she'll be safe, she continuously tries to do different things, change herself, her circumstances and her life. Going so far as trying to track her brother, Jacob, down, as far as experiencing new things and tracking a boy down to the Arctic in order to find out more answers about why this kiss stuck in her head when other memories did not. I loved that about her. I wish more people were a little bit more Flora. This book was a definitely interesting read. I'm glad to have to read it, I just wish things had been slightly different. This book was read and counts towards the British Books Challenge 2017.